Scotland’s cost-effectiveness watchdog has decided against making Gilead’s CAR-T therapy Yescarta routinely available to patients with two types of lymphoma, but gave a green light to Novartis’ rival Kymriah for a rare form of leukaemia. Kymriah “offers the possibility of long-term remission and is potentially a life-saving treatment option,” said the SMC in its guidance. 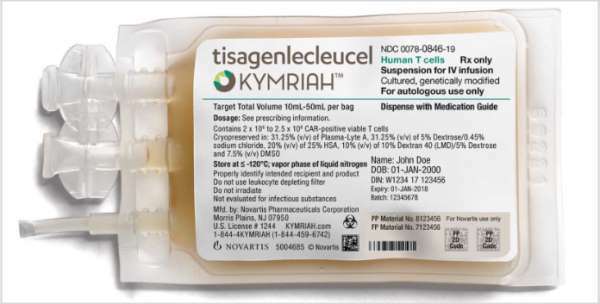 The agency is due to deliver a verdict on Kymriah’s other approved indication – diffuse large B-cell non-Hodgkin lymphoma (DLBCL) – in March. A similar pricing deal secured reimbursement by NHS England for the therapy last September, shortly after Kymriah was approved by the European Commission, and was one of the fastest funding approvals in the NHS’ 70-year history. Novartis charges a list price of £282,000 for a single course of the CAR-T treatment in the UK. Gilead was not so fortunate with the SMC’s initial verdict on Yescarta (axicabtagene ciloleucel) however, as it decided against its use in refractory and relapsed DLBCL and primary mediastinal large B-cell lymphoma (PMBCL) – both aggressive forms of non-Hodgkin’s lymphoma (NHL). Yescarta was rebuffed by the National Institute of Health and Care Excellence (NICE) in England and Wales as well in the first instance, but was eventually cleared for both DLBCL and PMBCL towards the end of last year. The drugmaker actually managed to get approval for funding in DLBCL ahead of Kymriah, but Novartis’ drug was also backed in this form of NHL earlier this year, setting the two CAR-Ts up for head-to-head competition in the UK for the first time. CAR-T therapies such as Yescarta and Kymriah harness the immune system to detect and destroy cancer, through a new process in which a patient’s white blood cells are collected, re-engineered in a lab to target and fight malignant cells, and then returned to their body in a single infusion. Despite some supply constraints, Kymriah has started to develop a bit of traction in the market, with sales reaching $76 million in 2018 and $26 million in the last three months of the year. Yescarta has had a rather quicker uptake, with sales coming in at $264 million and $81 million respectively in the same periods.